In 2015, Atlanta voters overwhelmingly approved $250 million in Renew Atlanta bonds to make repairs, improvements, and upgrades to transportation and building projects citywide. A lot of work has been done in District 8. Streets have been paved, sidewalks have been built, and work is under way to replace the 70-year-old Powers Ferry Road bridge next to Chastain Park. A two-mile extension of the PATH around Bobby Jones Golf Course was recently dedicated, and improvements are happening at Fire Stations 26 and 27. When the Renew effort and its companion TSPLOST programs launched, more than $1 billion in infrastructure repairs were identified. The $250-million Renew package and the taxes generated by the TSPLOST funds will NOT total $1 billion. Thus, choices must be made on what to do with the funding currently available, particularly as it relates to anticipated TSPLOST dollars. To receive feedback on the current list of projects under three proposed scenarios, Renew Atlanta will hold two public meetings for NW Atlanta residents. I encourage you to attend these meetings on Thursday, January 24, 6:30-8 p.m. at Sutton Middle School, 2875 Northside Drive and Thursday, February 28, at the same time and place. The Atlanta Speech School’s 40th Annual Fun Run will take place the first Saturday in NOVEMBER- Nov. 3rd, 2018. This run directly benefits children in the Wardlaw School at the Atlanta Speech School. Students with a variety of learning differences become confident learners through the careful guidance and instruction of their Wardlaw teachers. Using the money raised from the annual Fun Run, (which is the only fundraiser for the Wardlaw School, and from which we drive our operating budget for the following school year), we are able to help students reach their fullest potential. Please come out, join the fun, and support the Atlanta Speech School. The Neighborhood Cooperation Agreement is the 20-year agreement made in 2007 between Pace Academy and the West Paces-Northside Neighborhood Association which details the understandings between both parties in regards to Pace's reconfiguration and redevelopment of its property. The Agreement can be read in its entirety here. Election of new Board Members. What: Mr. Phillip Fender, who has purchased property on Moores Mill at the intersection and behind that lot on Wood Valley will be present to discuss his request for a variance to construct a combined driveway in order to build 3 homes. Please come, get information, ask questions and voice opinions. Of all the positive attributes of a neighborhood one considers during home tours and online searches, the quality of the neighbors is an uncertainty. Sure, you see people showing signs of friendliness as you enter the street or waving, but you consider what the relationship would be like if you made this place your permanent home. One such small street in our West Paces neighborhood underwent a sort of relationship challenge this past month. The issue in question was what to do with a dilemma in the shared cul de sac space. You see, some forty years ago a set of plants was planted and thrived in the cul de sac. These plants became so healthy that they married to form one six foot high bush stretching eleven feet at its widest point. A small family of rabbits lived under this bush and would often be seen frolicking in the dusky light as families were preparing dinner. Remarkable as it was, the bush provided a problem. No one was able to see anything behind the bush. This may not seem catastrophic when all residents are above five feet tall and the legal driving age; however, this small street went from a population of one to ten children within the span of 18months. What a tremendous sign of continued life energy in a stable community. Small children come with a greater need for outdoor space in order to expel their wild appetite for movement. Several neighbors discussed the possibility of removing the bush since no car approaching would be able to see a gaggle of small children on the pavement behind this monstrous green habitat. The discussion remarks varied from the length and breadth of the bush's history to the well being of its' furry inhabitants. After much deliberation, several engaged neighbors polled their direct neighbors and all agreed that the safety of the current community outweighed the history of the bush. Without any voiced objections, the bush was removed for a little over one hundred dollars. Fabulous, no obstruction at the base of the hill. Drat, no appealing feature or object to focus on when driving through the cul de sac. Action time. Each invested neighbor sought a landscaping company of their choosing to find bids, ideas, and material suggestions that would best suit our community. These bids, as you can imagine, ranged from under one thousand dollars to over four and a half thousand. Money led the decision, as it often does. We selected the long time landscaper of several homes on the street who envisioned a large simple grass segment with a mulched space for seating. Utilizing our resources, I was sent, on behalf of the street, to petition the board for a contribution to the project. My pitch was simple- the neighborhood shows support of the board through consistent membership rates and is seeking assistance to enhance and create beauty in a communal space. After offering written proposals from the landscape team, the board approved a contribution of two hundred dollars. With that two hundred in hand, I approached the landscape team to schedule sod and mulch installation. Neighbors eagerly awaited the next phase of the project. This empty land did not deter the children from turning it into imaginable spaces. Sod was installed for eight hundred dollars. Well, neighbors came out of the woodwork with fiscal contributions and ideas for seating options. We agreed on purchasing two five foot benches and almost over night, the sod settled in to it's new home, the mulch arrived a week later, and benches were assembled the following week. Neighbors even scoured nearby estate sales for planters. Then one Sunday afternoon, eureka, two concrete planters were found off Habersham at such a sale. For a little over one hundred dollars, two knee-high sturdy planters, with flowers I might add, were delivered to the end of our small street. Neighbors reveled in this open yet inviting meeting place. The children began playing pick up soccer matches, a football game on the fly, and meeting in the circle. For New Year's Eve, a small fireworks display was held and five families gathered, bundled and carrying bubbly to ring in 2016 at 6:00pm. Remember, lots of small children! The week after, a fire bowl was added and many warmly dressed couples brought blankets and came to the circle for fireside conversation. Obviously, the completed circle has only been in action for several weeks, but already neighbors comment about the draw towards the space. This experience demonstrates the power of beautification. Through a series of compromises and generosity, our neighborhood now has a common space which bridges the needs of twelve families, stayed within a modest budget, and provides a long term solution to an existing problem. Beautification has made that difference. Our small street may have lost a small family of rabbits, but in return we have enriched our lives and the lives of our children for years to come. That is the situation we are faced with today. The obvious question is, what can we do to protect ourselves and our families? The answer is, we need to be better informed on what to do, we need to be more vigilant, and we need to take action when confronted with suspicious activity. In short, we need to prepare ourselves for the environment in which we live today, we can’t look the other way when we observe something out of the ordinary just because we are in a hurry, or don’t want to become involved. I have written before that security is a three-legged stool, it takes the police, our security patrol and US to make our neighborhood safe. Working together we CAN make a difference. If you see something, DO something! Learn to trust our gut, after all, your gut feeling is a compilation of your prior experience. If you see something or somebody that doesn’t feel or look right, it probably isn't, CALL 911! The police WANT you to call. Calling 911 not only causes a response from the on duty police, it also alerts our security patrol of off duty and retired officers who carry police radios and who hear the dispatch. If patrolling, they can often respond quicker than on duty officers. During the holidays, we were especially vigilant and fortunate. As is our policy, we increased our patrol hours by 50% from Thanksgiving through New Years. 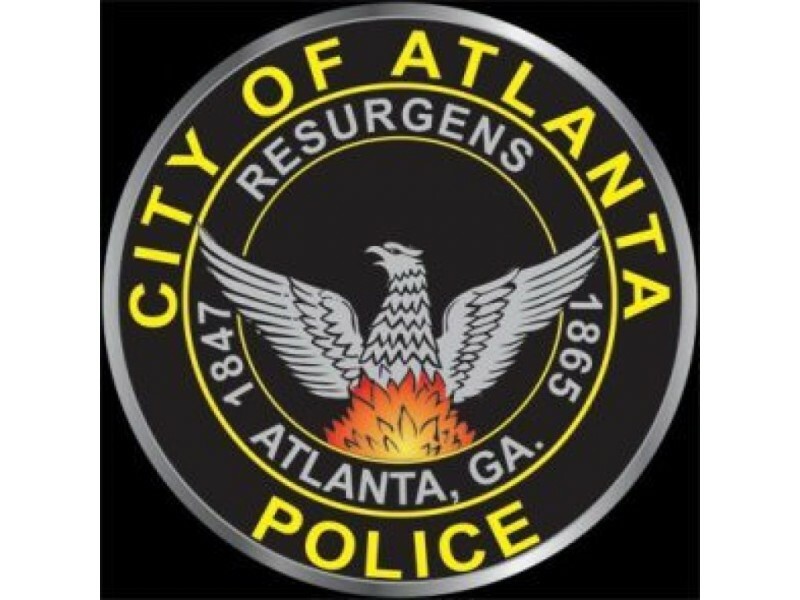 We are very fortunate, our record of criminal activity is far below surrounding neighborhoods. Let’s keep it that way; be a tuned in neighborhood, one that is tuned into security, is alert to and takes action to report suspicious activity. Lastly, since about 90% of Association dues go to funding our security patrol, encourage your neighbors to join. More members means more security patrol hours! In 2015, the WPNA initiated what we hope will be a permanent series of Neighborhood Social Evenings with a Guest Speaker. The goal of each quarterly meeting is to learn something new while enjoying good food, good wine, and good conversation with our neighbors. The venue of the new Pace Academy Upper School Commons is ideal, and the hors-d'oeuvres, prepared and donated by Pace, have been incredible. Add in two special wines from Sherlock’s, and the congeniality flows! 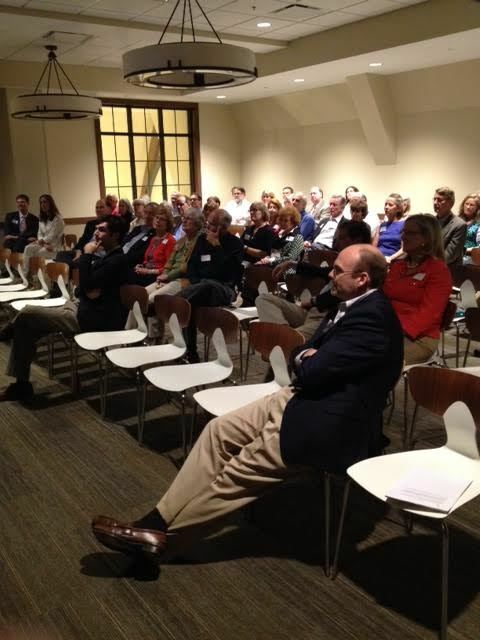 In September, we hosted Sheffield Hale, the CEO of the Atlanta History Center. 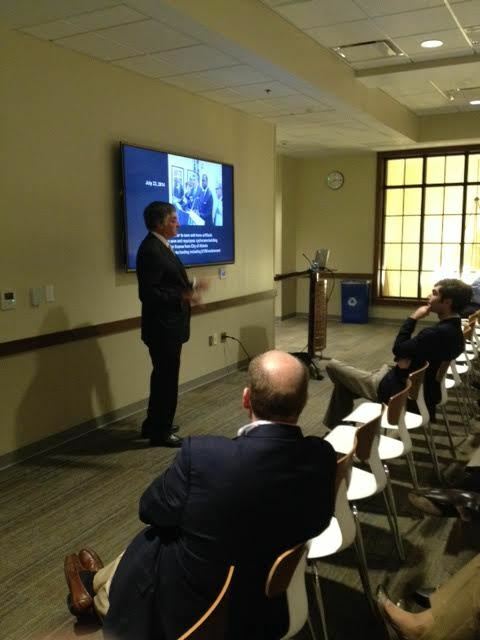 Then in November we welcomed Paul Morris, CEO of The Atlanta Beltline. Each speaker brought us up to date on developments with these important projects, and we also saw a glimpse of the future. Questions and answers followed the presentations. The next Neighborhood Social Evening will be on Wednesday, February 17, 2016. The speaker will be Mr. Dan Rutz, a senior health communications specialist with the Division of Global HIV and TB, Center for Global Health at the Centers for Disease Control and Prevention, and the subject will be the History and Future of the CDC in Atlanta. We will start with our Annual Meeting at 5:45pm, followed by wine, cheese and hors-d’oeuvres at about 7pm, and then the CDC presentation. An evite will go out soon by email to all members. We appreciate an RSVP for the food preparation. Please join us on February 17th at 5:45pm for a full evening. Our neighborhood had the good fortune in 1968 to have Colonel Seymour Liebmann, his lovely wife, Hinda, and their sons, Peter and David, choose Rilman Drive as their place to live. Sy, as he was affectionately known by all, was always, at heart, a farmer. He grew up in upstate New York in the Hudson Valley on his family’s farm where they grew apples and livestock. Sy’s older brother Mel later ran an Army-Navy store for more than 50 years that still serves the community. After earning his degree in mechanical engineering, Sy joined the U.S. Army Corps of Engineers, retiring with the rank of Colonel. In the Corps, he handled logistics of the Berlin Airlift, and later served as a military engineer in Korea during the Korean War. In Atlanta, Sy would go on to become president of a large construction company, A.R. Abrams, and form a very successful engineering consulting practice, Liebmann Associates. Shortly after he, Hinda and the boys moved to Rilman Drive, Sy became involved in the community. He became Chair of Neighborhood Planning Unit A (“NPU-A”) which reviews the planning and zoning matters for Western Buckhead, including the Nancy Creek area. Sy helped to organize the West Paces/Northside Neighborhood Association, and served as its first President. Sy also volunteered in community organizations, including one of his favorites, the Boy Scouts of America. A favorite weekend activity was to organize a fishing trip to Unicoi State Park or a hike on the Appalachian Trail. Sy was an early advocate of neighborhood preservation in the 1970s when Atlanta was undergoing a huge transformation into a regional center, its zoning laws were an afterthought, and the Atlanta mascot was a bulldozer. He was known for his intellect, his keen organizational abilities, his total selflessness in giving of his time to the neighborhood, and his brilliant critique of proposed development. If it were not for Sy’s relentless hard work, the development along West Paces Ferry Road and Northside Parkway would today be much like that on Peachtree and Lenox Roads. As Chair of NPU-A, Sy’s leadership in establishing a citizen review procedure for proposed zoning changes and other community issues soon made NPU-A the standard that not only other Atlanta NPUs, but other cities around the country sought to emulate. NPU-A applicants knew that when they appeared before the board under Sy’s leadership they would face rigorous examination of their proposals. Sy often surprised applicants by recalculating their engineering proposals on the spot as they presented their proposals. For our neighborhood, Sy was a great organizer of our opposition to many shoddy, ill-conceived proposed developments. We will not soon forget the time that Sy lead a turnout of well over 1,000 neighbors to attend a NPU-A meeting at Trinity Church to voice opposition to a proposed development on Northside Parkway. On November 14, 2015, our community suffered a great loss when Sy passed away. Sy will long be remembered as a great leader who, while conducting himself as a gentleman, was quick to stand-up for our neighborhoods as our strongest advocate. Perhaps Sy’s greatest contribution to the City of Atlanta was his leadership and training of others on how to make positive impact, and in particular, his strong moral compass of always stressing right from wrong, and looking far down the road to the consequences of actions that we take today. Services for Colonel Liebmann will held at Arlington National Cemetery in Arlington, Virginia, in March. He will receive full military honors, with a caisson, military band, troops, with a rabbi conducting his funeral ceremony.